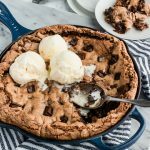 This Toffee Chocolate Chunk Skillet Cookie has a warm, gooey center with crispy edges–a decadent way to end a meal! Best enjoyed warm. Set out a metal baking sheet. In a heavy bottomed pot, combine the butter, sugar, salt, and water. Heat on medium, stirring with a wooden spoon constantly as the butter and sugar melt and begin to bubble. Continue cooking and stirring for about 3-5 minutes, or until the mixture has reached 300 degrees on a candy or instant read thermometer. If you don’t have a thermometer, it is ready when the mixture is the color of a raw almond skin. When it has finished cooking, pour the mixture onto the baking sheet and spread it out with the back of the wooden spoon. While it’s still hot, sprinkle the chocolate over the top, allowing the heat to melt the chocolate. Spread the melted chocolate out with a clean spoon and put in the refrigerator to let it harden. When it has finished setting, break and chop it into small pieces (abut 1/4″ to 1/2″) and store in an air tight container until ready to mix into the cookies. Place the butter in a 10 to 12 inch skillet and put it in the oven preheated to 325F. Allow it to melt completely and it begins to brown around the edges. Remove it from the oven and stir in the the sugars. They will look a little grainy and separated, but that’s fine. Allow them to cool until just warm-you should be able to touch the mixture without it feeling hot. Stir in the eggs and vanilla. The eggs will act as a binder, making the mixture smooth. Next mix in the dry ingredients until completely combined. Fold in the chocolate and toffee. If you do this step while the dough is still warm, some of the chocolate will melt be part of the dough. Spread the dough into the skillet (it should still be greased from the butter melting in it) and bake for 25-30 minutes, or until the edges are golden brown. The center should still be fairly gooey. Remove it from the oven and serve immediately, with ice cream if possible. You can chop up pre-made toffee to mix in, and it will be just as amazing. If you want a crispier/less gooey cookie, just leave the pan in the oven for an extra 5-10 minutes.